OVU is responsible for the successful submission of vehicle information to leading Internet sales sites for over 800 dealerships Australia wide. OVU has been a corner stone distribution tool in the market since 2002 and has in that time grown to be a trusted solution for dealerships looking to centralise their internet advertising into one easy to manage product. Download Photolink is our solution for uploading vehicle photos to CDS directly from your computer. 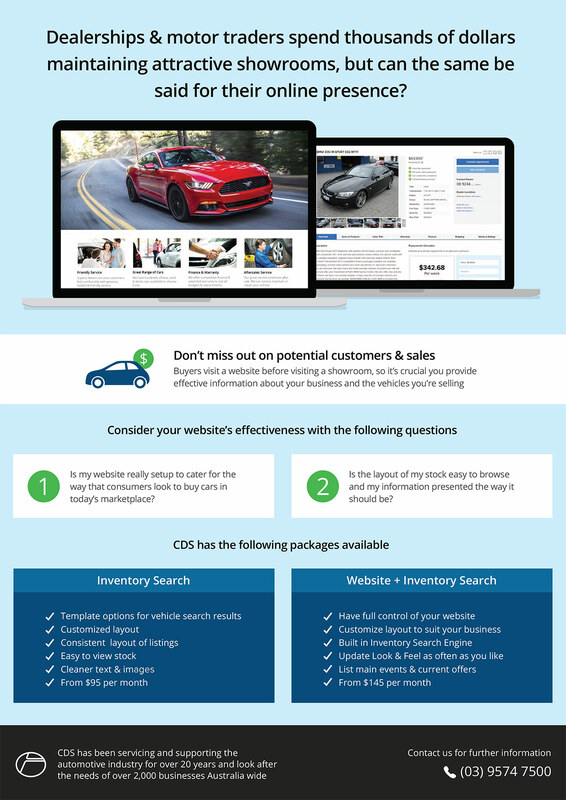 IVU (Internet Vehicle Uploader) was the initial product borne out of a need by small and large car dealers alike to initially provide information to drive.com.au in a simplified and time effective format. Over a period of time, it became obvious through the installation of IVU at many dealerships that similar information was being sent to other websites in a process that often took hours. We adapted our software to make it possible to send the same information to multiple websites with the click of one button, saving time and ensuring accuracy. The outcome - OVU (Online Vehicle Uploader) that is a web based version of IVU. The benefits are being very well accepted, extremely user friendly, more simplified uploading procedure but above all, access can be gained via any computer with internet access and all still backed with quality support. Simultaneously upload advertising quality stock information and images to any website in addition to your dealer website. OVU can offer uploads to any of the sites mentioned in the list below and many more. If the site you are considering OVU for is not listed, simply contact us and we will make the necessary arrangements that will allow you to do so if they are not already in place. As well as New & Used vehicle information, OVU is capable of distributing Motorbikes to bikes.drive.com.au, bikesales.com.au and bikepoint.com.au. OVU also has the ability to upload vehicles to your existing website. Whether you have no existing website, need mobile-friendly stock integration into your existing site, or your online presence is in need of a facelift, we have the solution for you. All with the high service levels and low cost you have come to expect from CDS. Below are a few examples of a range of dealers that have benefited from taking advantage of integrating their New and Used Car Search engines to OVU. In many cases, we have worked with existing websites, and have merely introduced the Used Car search page in a seemingly fully integrated manner. This can make the whole process a lot cheaper than what you have been used to in the past. Are you an existing OVU customer already using our software to upload information to one of the used car sales websites? To see how your used car information could come up on our website, contact us and ask us to show you a sample of the used car search engine implemented with your cars on 1300 765 237, or via > e-mail. If you are not an existing OVU customer but would like to view a sample of your cars on our website, with no obligation, simply email us an electronic list of your cars and we will prepare the data for you and let you know when it's ready to view. The process should only take minutes! Once the information has been uploaded, we'll send you an e-mail so that you can see your potential website in action! Prefer to talk to real people? Call us now on 1300 765 237.